Sabine Parish, Louisiana, has a school. 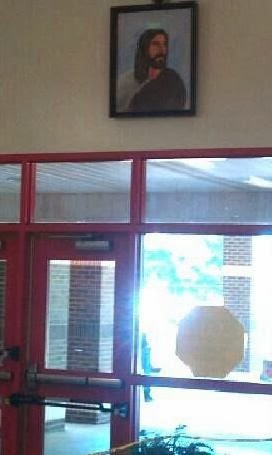 It is supposedly a public school. Paid for by taxpayers and part of the local government. Instead it is a Christian school ... exclusively! ISN'T IT AMAZING WHAT THE _____________ HAS MADE!!!!!!!!!!!!!!!!!!!!!!!!!!!!!!!! And guess what! The "Lord Boda [Buddha]" isn't the "right" answer! Did I mention that the plaintiff school child is of Thai descent and a Buddhist? As [the "science" teacher] was returning the tests to students, one student declared again, for the whole class to hear, that "people are stupid if they think God is not real." [The "science" teacher] agreed, responding, "Yes! That is right! I had a student miss that on his test." But we are not finished yet! When the outraged parents went to complain to the school superintendent, they were told that "this is the Bible Belt," and she recommended that they simply tolerate [the "science" teacher's] proselytization because "[t]eachers have religious freedom." In a irony meter exploding statement, the superintendent then wondered whether the child "has to be raised Buddhist" and even asked whether he could "change" his faith ... because, of course, teachers have religious freedom but children don't! [She] told her students that evolution is "impossible" and a "stupid" theory that "stupid people made up because they don't want to believe in God." She has informed her students that, "if evolution was real, it would still be happening: Apes would be turning into humans today." The Sabine Parish School Board has only recently been made aware of the lawsuit filed by the ACLU. A lawsuit only represents one side's allegations, and the board is disappointed that the ACLU chose to file suit without even contacting it regarding the facts. The school system recognizes the rights of all students to exercise the religion of their choice and will defend the lawsuit vigorously. This will, doubtlessly, play out the usual manner: the locals will insist that their behavior is perfectly legal because they are the majority and demand the school board defend their right to impose their religious beliefs on all and sundry. Second, they will be seduced by the offer of some Christian group (such as the merry band of incompetents at the oxymoronic "Liberty Counsel") to fight the case because they are getting "free" representation, not realizing that, when the bill comes due, Liberty Counsel will be nowhere to be found. In which case the students of Sabine Parish will be the losers, when hundreds of thousand dollars are siphoned away from, you know, actually educating them. Either way, the school board is toast! By the way, here is the father's moving story. I wonder what action, if any, can be taken against the teacher. There appears to be strong evidence that she is in breach of the First Amendment and that she is also failing in her duty to teach what I would hope is the prescribed science curriculum for the district. Is it the case that she can continue to what she has been doing unless someone with standing is prepared, as in this case, is prepared to take legal action to make her stop. The way it (should) work is that the school board makes her toe the line. If she doesn't, the school's insurance company will disclaim coverage for her and the school board disownes her and she's on her own to pay her legal bills and any damages. If she continues, the first will certainly happen. The second might not but, even then, she might not be able to enforce any judgment against her personally against the school board because tax money generally can't be used to recompense those government officials who willfully break the law. In short, if there is any justice in the world, any continued actions by her against the Constitution will result in her losing everything. This breath-taking inanity leaves the Dover board's antics in its dust. 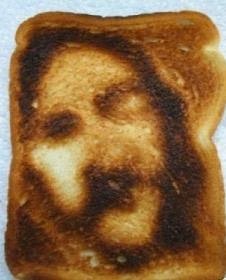 The "Jesus toast" looks more like Cyrano de Bergerac. 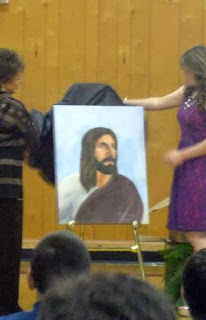 Come to think of it, so does the school's "portrait."